Call him whatever you want: Senator. Supreme Chancellor. Darth Sidious. Emperor. The name doesn't matter. The important part is that Sheev Palpatine, the biggest and baddest of all of Star Wars' big bads, will return in Star Wars: Episode IX — The Rise of Skywalker. 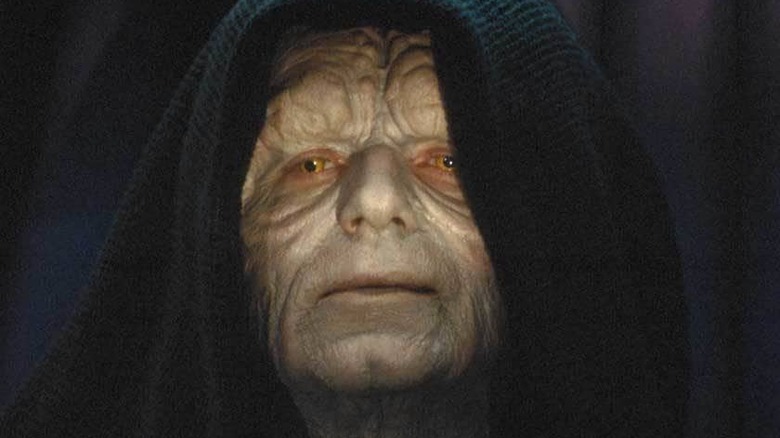 Not only does the Dark Lord of the Sith's signature cackle close out The Rise of Skywalker's thrilling first teaser, but in case there was any doubt what that means, Palpatine actor Ian McDiarmid took the stage at Star Wars Celebration 2019 moments after the trailer's premiere and growled, in-character, "Roll it again." That's right, baby. Palpatine is back. But how? After all, the last time we saw the Naboo-politician-turned-interstellar-despot, Darth Vader was chucking him into a bottomless pit, presumably to his death. 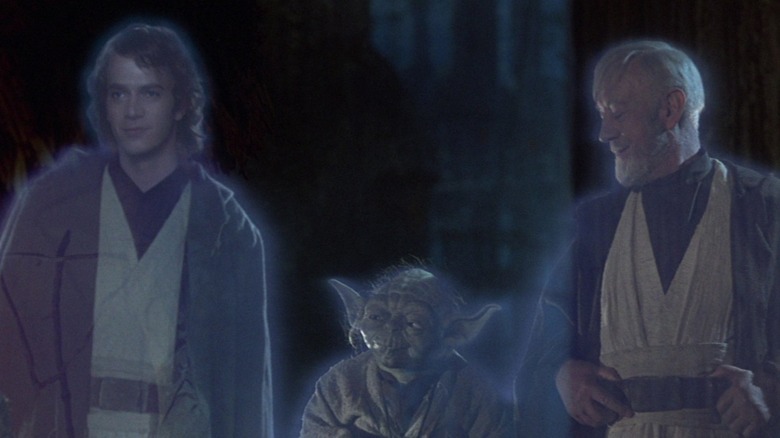 Well, here's the secret: in the Star Wars universe, dead doesn't always mean dead. Thanks to Star Wars' twisty, complicated canon, there are plenty of ways that the lightning-slinging villain could've come back from the dead — or, possibly, escaped death entirely. Here are just a few. In Star Wars, just because you fell into a seemingly bottomless pit doesn't mean that you died. Luke jumped off of a platform in Cloud City, and despite the fact that he only had one hand, ended up just fine. In the Legends timeline, Boba Fett climbed out of the Sarlacc pit and went on to cause even more trouble. Samuel L. Jackson's Mace Windu hasn't made any official appearances since Darth Sidious pushed him out a window, but George Lucas says he might still be alive. If anyone would know, it's that guy. Heck, look at what happened with Darth Maul. At the end of The Phantom Menace, Obi-Wan Kenobi cut Maul in half and then sent him careening him down a reactor shaft. Somehow, it didn't stick. 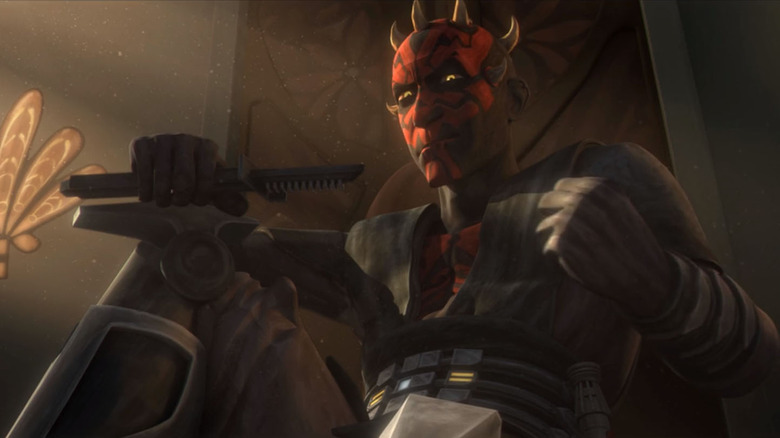 Despite missing half of his body, Maul rescued himself using the Force, got himself a set of mechanical legs, and went on to become a major thorn in the galaxy's side. In The Clone Wars, Maul united the galaxy's underworld and took over the planet Mandalore. In Solo, he was head of the Crimson Dawn crime syndicate. In Rebels, he tried to recruit Ezra Bridger as his new apprentice, and would probably still be kicking around if he hadn't challenged Obi-Wan Kenobi to an ill-advised rematch. In other words, we never saw the Emperor's body. Until we do, we can't count him out for good. That's just how Star Wars works. 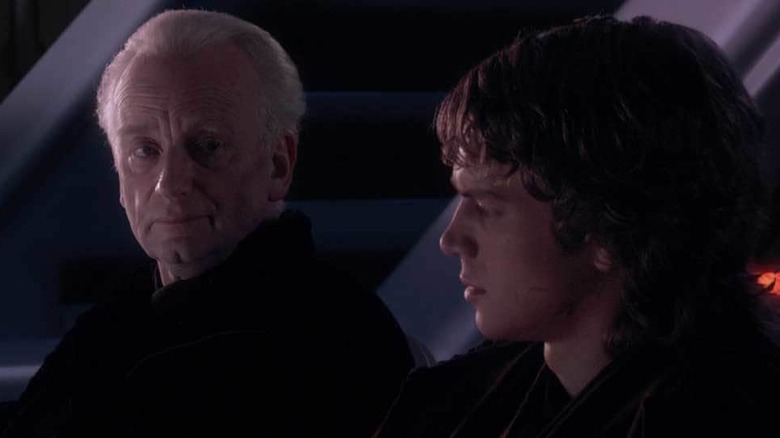 In Star Wars: Episode III — Revenge of the Sith, Palpatine tries to sway Anakin away from the light by making a promise: the dark side of the Force can give talented Sith immortality, and even bring people back from the dead. Anakin doesn't know it at the time, but Palpatine isn't just making this up. He's seen it firsthand, thanks to a former Sith Lord known as Darth Plagueis. As Palpatine explains, Plagueis figured out how to manipulate midi-chlorians using the Force, unlocking the secrets of life itself. Using his powers, Plagueis was able to keep his loved ones alive, supernaturally prolong his own life, and even create new living beings from scratch. Unfortunately, Plagueis made one mistake: he taught his apprentice everything he knew. Once Plagueis' second-in-command learned all of his master's secrets, he killed Plagueis while the elder Sith was sleeping, becoming the new Dark Lord. And who was that apprentice? Why, Palpatine, of course. We know from Revenge of the Sith and some Star Wars comics that Darth Sidious knew all of Plagueis' tricks, including creating new life — where, exactly, do you think Anakin Skywalker came from? — so if Palpatine used his knowledge to escape death at the hands of his own apprentice, it wouldn't be much of a stretch. Palpatine has already come back from the dead once. 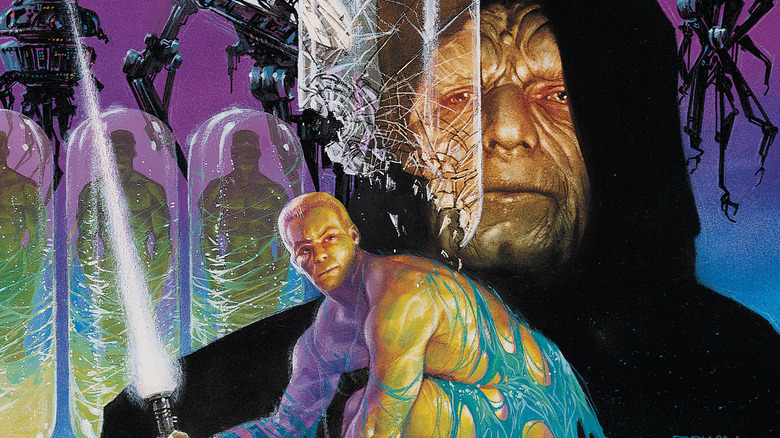 In Dark Empire, a trilogy of miniseries published by Dark Horse Comics in the early '90s, the Emperor returns about five years after The Return of the Jedi by transferring his consciousness into a clone body. In fact, as Luke Skywalker quickly learns, Palpatine created an entire stockpile of clones that he can jump between as he sees fit. That makes destroying Palpatine near impossible — if you kill one clone, he'll just use another one — which is enough to make a despairing Luke submit to the dark side. There's just one problem with this story: it's no longer canon. When Disney bought Lucasfilm in 2012, it wiped the slate clean, sequestering all of the old sequel novels and comics away in the non-canon Legends line. That paved the way for movies like The Force Awakens and The Last Jedi, but it also means that Palpatine's revival is no longer a part of Star Wars history. Not yet, anyway. The new, Disney-ified Star Wars hasn't shied away from incorporating old Legends material when it makes sense. Grand Admiral Thrawn, the antagonist of the Heir to the Empire trilogy that kicked off the old Expanded Universe, played a huge role on Star Wars Rebels, and a bunch of old EU planets, ships, and factions have popped up in the new books and comics, too. Star Wars is already lousy with clones, so it wouldn't take much to get the audience to buy into Palpatine's clone-based resurrection. Hey, it worked once before. If there's something strange in your nearest space sector, who ya' gonna call? Death didn't stop Obi-Wan Kenobi. It didn't stop Yoda. It didn't even stop Anakin Skywalker, despite the fact that he'd been fighting for the bad guys for years. All three of those gentlemen stuck around after death as shimmering blue Force ghosts, who stuck around to give their still-living students and friends guidance from beyond the grave. Now, common Star Wars wisdom contends that the Sith can't become Force ghosts, which is one of the reasons why they're so focused on amassing earthly power. That might be changing. 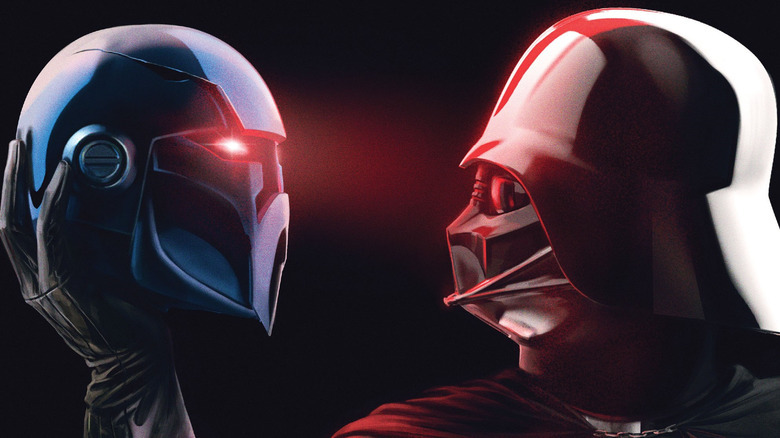 The Art of Star Wars: The Force Awakens reveals that Anakin Skywalker/Darth Vader almost showed up in Episode VII as a hybrid dark side and light side Force ghost — and who wrote The Force Awakens? Why, none other than director J. J. Abrams, who is returning to helm (and co-write) The Rise of Skywalker. It's easy to imagine that a spectral Palpatine has been whispering advice in Supreme Leader Snoke's ear this whole time. Maybe now that he's gone, Kylo Ren will be receiving Sidious' posthumous messages too. Finally, while there's no guarantee that this will happen, a Force ghost showdown between recently departed Jedi Master Luke and his old foe would be an amazing way to wrap up the entire Skywalker saga for good. Even if Force ghosts are off the table for Dark Side users, Marvel's recent Darth Vader comic books have introduced another way the Sith can extend their lives beyond the destruction of their physical bodies. Decades before Palpatine rose to power and established the Galactic Empire, a Sith heretic named Momin infused a mask with his consciousness, through which he lived on after death. Years later, the Emperor instructed Darth Vader to build his own castle, and gave Vader the Mask of Lord Momin. Once Vader arrived on the planet Mustafar, the mask's true nature revealed itself. Using the mask, Momin possessed various Imperial soldiers, giving Momin a series of new bodies. Together, Momin and Darth built Vader's fortress. It was all a trick, of course — Momin was a Sith, after all, and was really working for himself the whole time — but the whole escapade proves the Sith can attach their essences to physical objects and live on through them. In addition, we know from spinoff material like Chuck Wendig's Aftermath trilogy and Star Wars Battlefront II that Palpatine was hoarding Jedi and Sith artifacts before his demise, including the compass that eventually led Luke to his home-in-exile, Ahch-To. If one of those antiquities also holds the essence of Darth Sidious himself? Let's just say we wouldn't be all that surprised. On the other hand, Palpatine doesn't actually need to return from the dead in order to cause trouble. Even in death, he seems to be doing just fine. As seen in Marvel's Star Wars: Shattered Empire series, and later on expanded in Star Wars Battlefront II's single-player campaign, the Emperor had plans in place in the case he died — and they almost took the Rebel Alliance and the Galactic Empire down with it. Shortly after the destruction of the second Death Star and the death of Emperor Palpatine, creepy-looking sentinel droids wearing holographic projections of his face appeared in Imperial strongholds to deliver the despot's final orders: burn everything down. See, it turns out that Palpatine was one of those "if I can't have it, nobody can"-type villains, and didn't that the Empire deserved to survive without him at the helm, so he posthumously launched Operation Cinder, in which a network of satellites were programmed to destroy planets loyal to both the Empire and the Rebels while a hand-selected group of loyalists escaped to the Unknown Regions to build a newer, better Empire. The Rebel forces stopped Operation Cinder from wrecking multiple worlds, but the rest of Palpatine's contingency plan worked — that's why we have the First Order. There's nothing to indicate that Operation Cinder ended there, either. 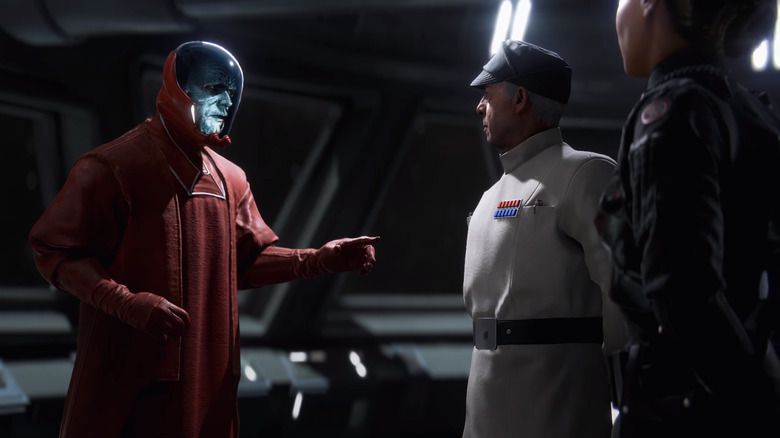 Maybe Palpatine will only appear in Star Wars: Episode IX through old recordings and holograms, but that doesn't mean he won't be pulling the strings. After all, Palpatine plans ahead. The Jedi and the Sith are more like outer-space wizards than anything out of hard science fiction, and Lucasfilm's Star Wars animated series lean into that whole-heartedly. The Clone Wars and Rebels are full of Jedi and Sith warriors, but they're also home to more mysterious orders like the Nightsisters of Dathomir, who are often referred to as witches, and mystical techniques like Sith alchemy. Non-traditional Force users have non-traditional Force powers, too, and including a few that dabble in matters of life and death. Two different episodes of The Clone Wars feature Force-enabled resurrections. In "Massacre," an elderly Nightsister named Daka raises an entire army of her dead comrades and pits them against Count Dooku's droid forces. In "Altar of Mortis," a mysterious Force wielder known as Daughter sacrifices her life force to resurrect Ahsoka Tano, Anakin Skywalker's plucky apprentice. Both of those events are much wilder than any of the Force powers that pop up on the movies, but it's canon, and it's all thanks to the Force. Well, you know who else was really good at using the Force? Yeah, Palpatine. Admittedly, it would be hard for Palpatine to resurrect himself, but the guy's crafty. Once he's unlocked the secrets of Force magic, who knows what kind of mischief he'll get up to? If The Last Jedi pushed the limits of what the Force could do, Star Wars Rebels obliterated them entirely. 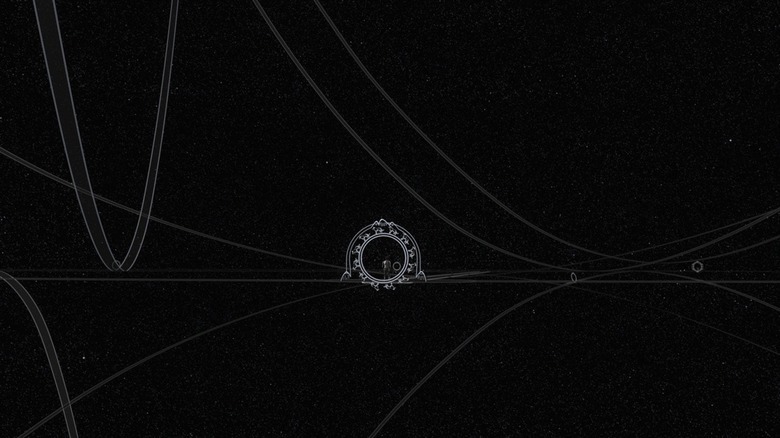 During its final season, Rebels went all out and introduced time travel to the franchise via the World Between Worlds, a Force-powered nexus that links together all of time and space. That's an extremely powerful tool, especially when it comes to cheating death. In Rebels, hero Ezra Bridger used the World Between Worlds to rescue Ahsoka Tano from a near-certain demise at the hands of her former master, Darth Vader, by plucking her out of the timestream shortly before Vader could strike her down. Ezra wasn't the only one vying for control of the World Between Worlds, either. In Rebels, Palpatine himself tries to seduce Ezra to the dark side in order to gain access to the World Between Worlds and all of its power (he's even voiced by Ian McDiarmid, in a special guest appearance). Palpatine's plan doesn't work during Rebels, but it also wouldn't be much of a surprise if the Sith Lord continued to try to find a way to access the World Between Worlds. It'd be even less shocking if he succeeded. We're not sure that Lucasfilm would hang a major Episode IX plot point on one episode of a kid-focused animated series, but in Disney's new world order, everything is canon. Hey, it's possible. Finally, we have the longest of all long shots: maybe Palpatine will return to the big screen as a member of the living dead. Does that sound ridiculous? It should, but zombies actually are part of Star Wars canon, thanks to Disney's new "everything counts" approach to storytelling in a galaxy far, far away. 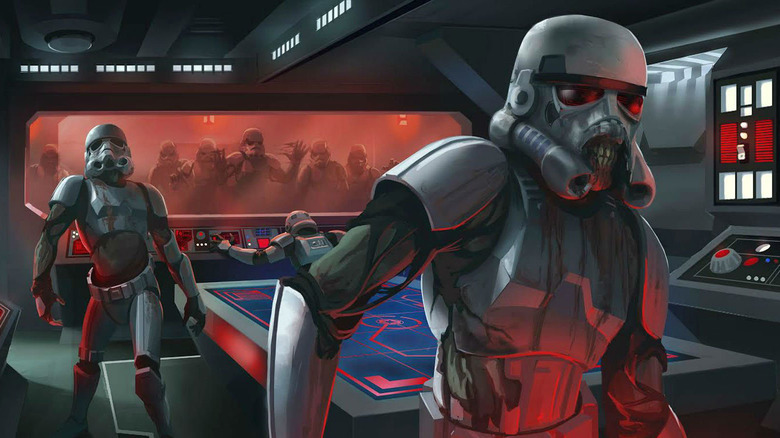 Specifically, the now-discontinued mobile strategy game Star Wars: Commander contained enemies called Death Troopers, which were basically zombies wearing stormtrooper armor. According to Star Wars: Commander lore, the Death Troopers were regular Imperial soldiers who ran afoul of a "bioweapons project gone horribly awry." The infected subjects succumbed to a fatal virus, suffered painful and violent deaths, and then rose up as "mindless, cannibalistic monster[s]" wielding blasters. In other words, the Empire clearly has the means to reanimate corpses, and that knowledge probably didn't disappear when the second Death Star went up in smoke. Sure, bringing Palpatine back as a shambling, brain-craving zombie would be really, really weird, but if Star Wars: Episode IX wraps up the entire Skywalker saga with a shot of the Emperor gnawing away on Kylo Ren, we'll find it awfully hard to complain.